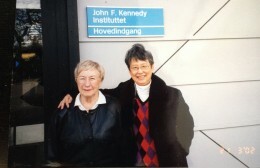 I came to the JFKI in November of 1986 as a visiting scholar from China. I was greatly impressed by both efficiency of the chromosome lab and the leading part of Margareta. Later on, I perceived that behind her unremitting pursuit of science and her leading talent there was a warm heart, full of sympathy, and kindness. I remember always her care for me during my 2-year stay in the JFKI. With deep gratitude and affection, I send my tribute to this outstanding scientist and brave woman.